Outputs a signal if the metal part of the Sensor was touched. You can adjust the sensitivity of the sensor with the controller. Digital Out: At the moment of contact detection, a signal will be outputted. The sensor has 3 main components on its circuit board. First, the sensor unit at the front of the module which measures the area physically and sends an analog signal to the second unit, the amplifier. 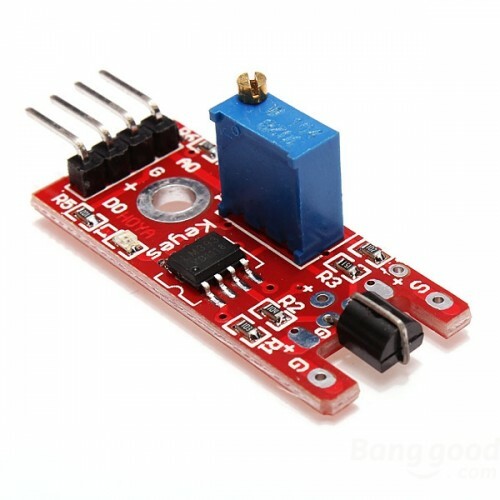 The amplifier amplifies the signal, according to the resistant value of the potentiometer, and sends the signal to the analog output of the module. The third component is a comparator which switches the digital out and the LED if the signal falls under a specific value.